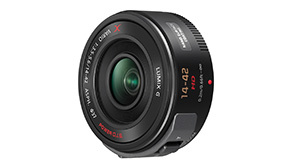 The new LUMIX premium �X� brand is at the forefront of the next generation of camera lenses; utilising the best in advanced optical performance. The new lenses feature Panasonic�s unique nano surface coating technology, optical image stabilisation (POWER O.I.S.) and aspherical and ED glass elements to achieve superb image quality while maintaining compact and light design. Both lenses utilise Panasonic�s nano surface coating to significantly minimise the reflection at entire visual light range. The results are incredibly clear pictures and a dramatic reduction in ghosting and lens flare. The zoom lever on the lens barrel, an industry-first for interchangeable lenses, provides the user with fast, precise and silent zooming especially when shooting HD video recording. Manual focusing is also available, with the manual focus lever for users requiring a more precise control. The new POWER O.I.S. (Optical Image Stabilisation) which is newly integrated in both the LUMIX G X lenses makes it easy to take images with great clarity even in low-light conditions. With the improved sensitivity of the gyro sensor, the new POWER O.I.S. dramatically improves the hand-shake correction power - resulting in visibly improved sharpness. Specifically, the new LUMIX G X H-PS14042 lens offers a versatile zoom range that extends from 14mm to 42mm (35mm equivalent: 28-84 mm) making it suitable for a wide range of scenes, from dynamic landscape shots to impressive portrait images. The collapsible power zoom lens is ultra-compact when not in use, and expands to a 3x zoom lens when switched on. It is approximately the same size as a 20mm pancake lens but with the added features that a zoom brings. The two ED lenses and four aspherical lenses correct a variety of aberrations to deliver excellent optical performance whilst minimising distortion levels and chromatic aberration even at the 28mm wide-end. In comparison to the Lumix G Standard 14-42mm kit lens, these new lenses provide significant improved optical performance yet achieve a 58% reduction in size (when turned off) and a 48% reduction in weight. 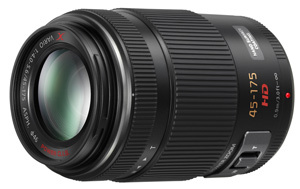 The new LUMIX GX H-PS45175 tele-zoom lens has a versatile focal range from 45mm to 175mm (35 mm equivalent: 90-350 mm). It features notably high contrast and resolution for images shot at its wider-end, which makes it great for taking portrait shots; meaning it complements the LUMIX G X H-PS14042 lens perfectly. In an industry-first, the adoption of its fast motorised Multi-Actuator Floating Inner Focus System*** ensures that air and dust isn�t sucked into the lens during zooming or focussing, and downsizing in both size and weight is achieved while improving image quality. The LUMIX G X VARIO lenses are available in the highly stylish and sophisticated colour options of black and silver, a perfect complement to the LUMIX G and LUMIX GF3 cameras. The GF3X kit containing the GF3 body and the LUMIX G X VARIO PZ 14-42mm/F3.5-5.6 ASPH./POWER O.I.S. will be available throughout Europe.